Jean-Louis-Ernest Meissonier (21 February 1815 - 21 January 1891) was a leading French Classicist painter and sculptor famous for his depictions of Napoleon, his armies and military themes. He documented sieges and manoeuvres and was the teacher of Edouard Detaille. He was born at Lyon. From his schooldays he showed a taste for painting, to which some early sketches, dated 1823, bear witness. After being placed with a druggist, he obtained leave from his parents to become an artist, and, owing to the recommendation of a painter named Potier, himself a second class Prix de Rome, he was admitted to Leon Cogniet's studio. After some not very happy attempts at religious painting, he returned, under the influence of Chenavard, to the class of work he was born to excel in, and exhibited with much success the Game of Chess (1841), the Young Man playing the 'Cello (1842), Painter in his Studio (1843), The Guard Room, the Young Man looking at Drawings, the Game of Piquet (1845), and the Game of Bowls, works which show the finish and certainty of his technique, and assured his success. After his Soldiers (1848) he began A Day in June, which was never finished, and exhibited A Smoker (1849) and Bravos (Les Bravi, 1852). In 1855 he touched the highest mark of his achievement with The Gamblers and The Quarrel (La Rixe), which was presented by Napoleon III to the English Court. His triumph was sustained at the Salon of 1857, when he exhibited nine pictures, and drawings; among them the Young Man of the Time of the Regency, The Painter, The Shoeing Smith, The Musician, and A Reading at Diderot's. To the Salon of 1861 he sent The Emperor at Solferino, A Shoeing Smith, A Musician, A Painter, and M. Louis Fould; to that of 1864 another version of The Emperor at Solferino, and 1814. He subsequently exhibited A Gamblers' Quarrel (1865) and Desaix and the Army of the Rhine (1867). On the 24th of May 1884 an exhibition was opened at the Petit Gallery of Meissonier's collected works, including 146 examples. As president of the jury on painting at the Exhibition of 1889 he contributed some new pictures. In the following year the New Salon was formed (the Societe Nationale des Beaux-Arts), and Meissonier became its president. He exhibited there in 1890 his painting 1807; and in 1891, shortly after his death, his Barricade was displayed there. Besides his genre portraits, he painted some others: those of Doctor Lefevre, of Chenavard, of Vanderbilt, of Doctor Guyon, and of Stanford. He also collaborated with the painter Francais in a picture of The Park at St Cloud. In 1838 Meissonier married the sister of M. Steinheil, a painter. Meissonier was attached by Napoleon III to the imperial staff, and accompanied him during the campaign in Italy at the beginning of the war in 1870. During the siege of Paris in 1871 he was colonel of a regiment de marche, one of the improvised units thrown up in the chaos of the Franco-Prussian war. In 1840 he was awarded a third-class medal, a second-class medal in 1841, first-class medals in 1843 and 1844 and medals of honour at the great exhibitions. In 1846 he was appointed knight of the Legion d'honneur and promoted to the higher grades in 1856, 1867 (June 29), and 1880 (July 12), receiving the Grand Cross in 1889 (October 29). He nevertheless cherished certain ambitions which remained unfulfilled. He hoped to become a professor at the Ecole des Beaux-Arts, but the appointment he desired was never given to him. He also aspired to be chosen deputy or made senator, but he was not elected. In 1861 he succeeded Abel de Pujol as member of the Academy of Fine Arts. On the occasion of the centenary festival in honour of Michelangelo in 1875 he was the delegate of the Institute of France to Florence, and spoke as its representative. Meissonier was an admirable draughtsman upon wood, his illustrations to Les Conies Remois (engraved by Lavoignat), to Lamartine's Fall of an Angel to Paul and Virginia, and to The French Painted by Themselves being among the best known. The leading engravers and etchers of France have been engaged upon plates from the works of Meissonier, and many of these plates command the highest esteem of collectors. Meissonier died in Paris on the 21st of January 1891. 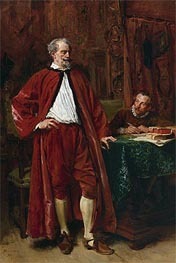 When the Societe Nationale des Beaux-Arts was re-vitalized, in 1890, Ernest Meissonier was elected its first chairman, but he died soon; his successor was Puvis de Chavannes. The vice-president was Auguste Rodin. His son, Jean Charles Meissonier, also a painter, was his father's pupil, and was admitted to the Legion d'honneur in 1889.